The winter season is well upon us and the Christmas spirit is alive and well in Hedley Park Montessori school. The children are deep in character for their Christmas extravaganza, and all I can say is, even though snow may be forecast for this week. On the 18th December “the sun will come out ……..” and it wont be “a hard knock life for us” … what can I say, we will offer you “Annie” excuse to get in the Christmas mood and “wear a smile”. For parents looking for tickets, please talk to a member of staff. Our rehearsal is today Monday 10th (see Facebook page for details) for children from junior infants upwards. On the big day itself (18th December) there will be an arrival schedule for each class group that will be communicated to you in the coming days. With our play housekeeping done let us fill you in on all the work we’ve been doing throughout November. Starting with our senior class who got into the spirit of Science early in the month and have brought a scientific method to their studies in all subjects since. 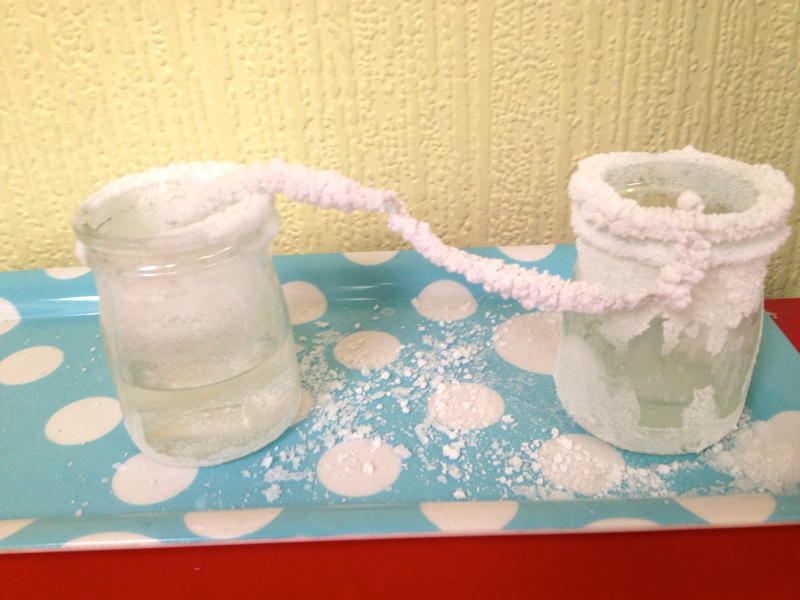 They looked at Arctic insulation with a very hands-on experiment to show how polar animals keep warm. 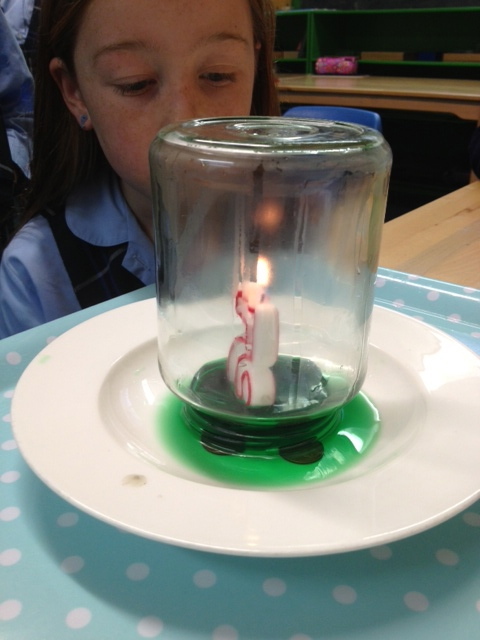 Does a flame burn oxygen? Then a look at another side of that coin with an experiment to prove that a flame burns oxygen, this was fascinating as they got to witness the vacuum created by the flame as it burned the available oxygen and the water rose to fill the void generated. In a further experiment, that took a little more time to witness, the senior class also created their own crystals along a line of thread. It was fascinating to watch the frosty looking crystals spread along as we progressed through the week. The senior students also took a scientific look at leaf structure and types with some leaf rubbings and parts of a leaf analyses. 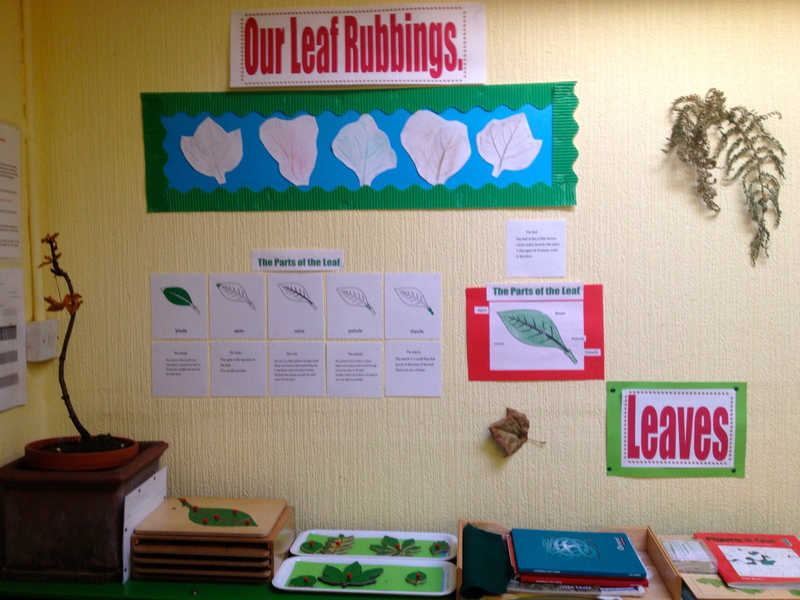 It is this sensorial approach to learning that the students have hones through their years in Montessori education that allows them to perceive the finest details of each leaf structure, identifying leaf types by touch alone, and internalising and synthesising this knowledge to build on their schemes of the natural world. 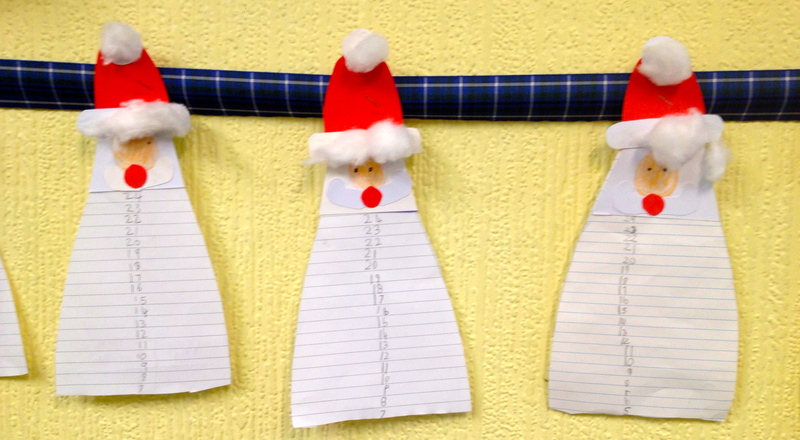 They got into the seasonal spirit with some lovely language arts display work, both as gaeilge and as bearla. 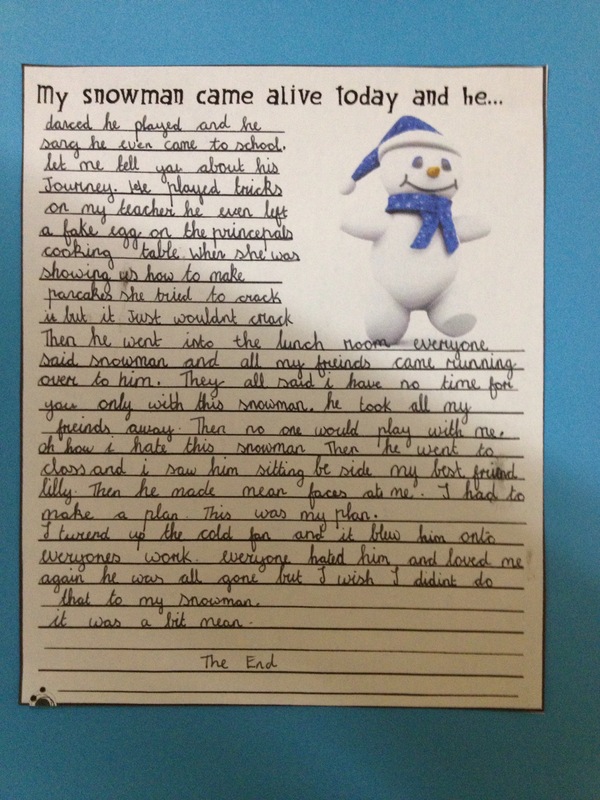 In English language arts they created original stories from the starting sentence “My snowman came alive today and he…” very creative an imaginative stories are on display on the walls. 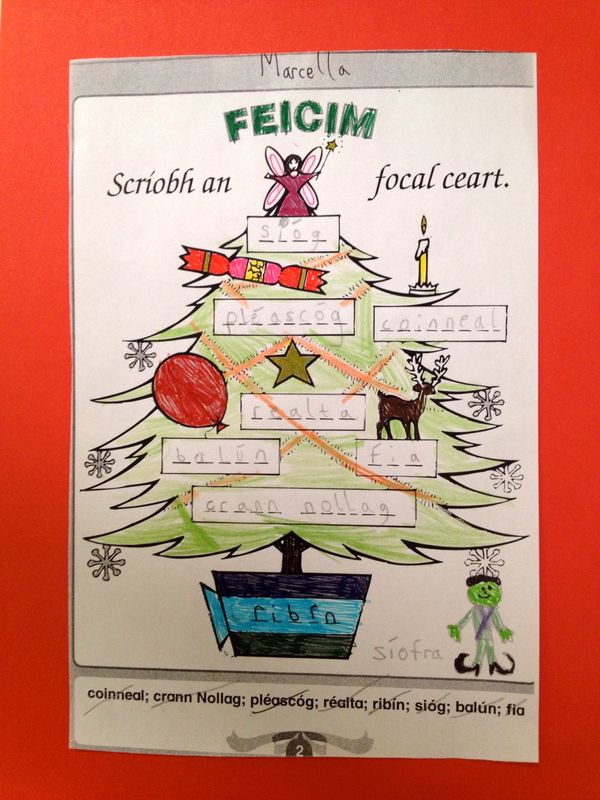 In Irish language arts they completed their Crann Nollag focloir sheets. 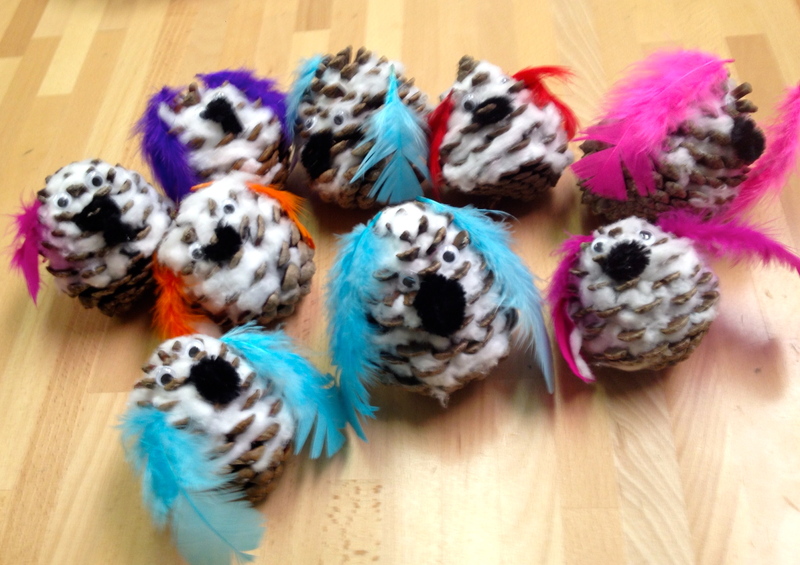 In a little bit of arts and crafts the class created gorgeous winter fir cone owls. I’m sure you will agree each is a very unique size and personality, but make a wonderfully unified clan en-masse, reflecting the class group itself. 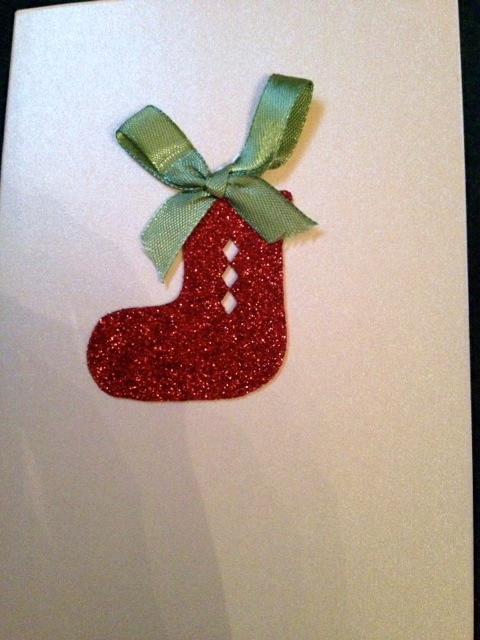 Another art moment took the class to a practical life exercise that helped them count down the days to Christmas day. They made a Santa with a numbered beard, each day they cut a little strip off with that days date until they have trimmed the beard in full and Santa is on his way! Finally taking their place as the elders of the school, the senior class lead the school in creating wonderful Christmas cards and Yule logs for the sale of work at our fundraising breakfast last week. It was wonderful to see the admiration in the younger students working with their older schoolmates and in turn the care and attention shown to the younger student by the senior students. This really is the essence of a Montessori environment, younger children learning from and aspiring to the elder students, and the elders assuming responsibility and learning through teaching the younger. It was wonderful to see and experience. 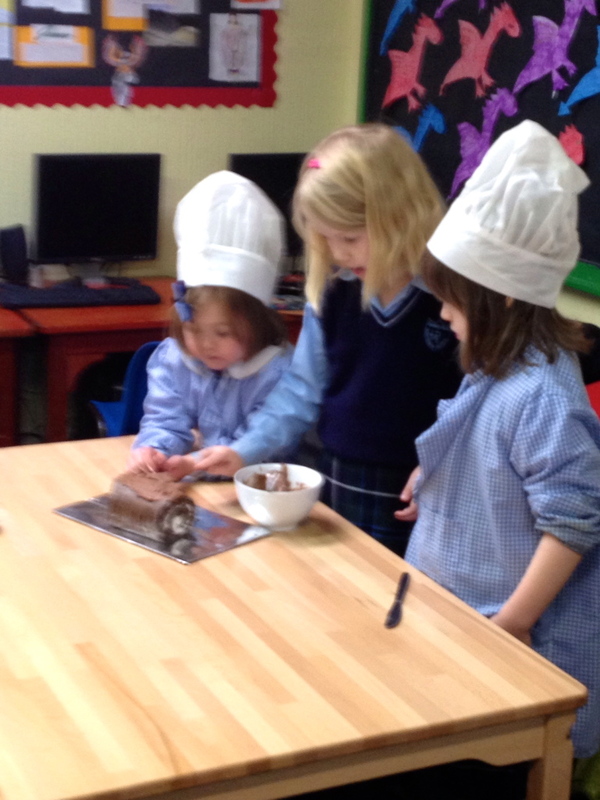 While all that was going on in the senior class the reception and nursery classes were not falling behind in their winter learning. 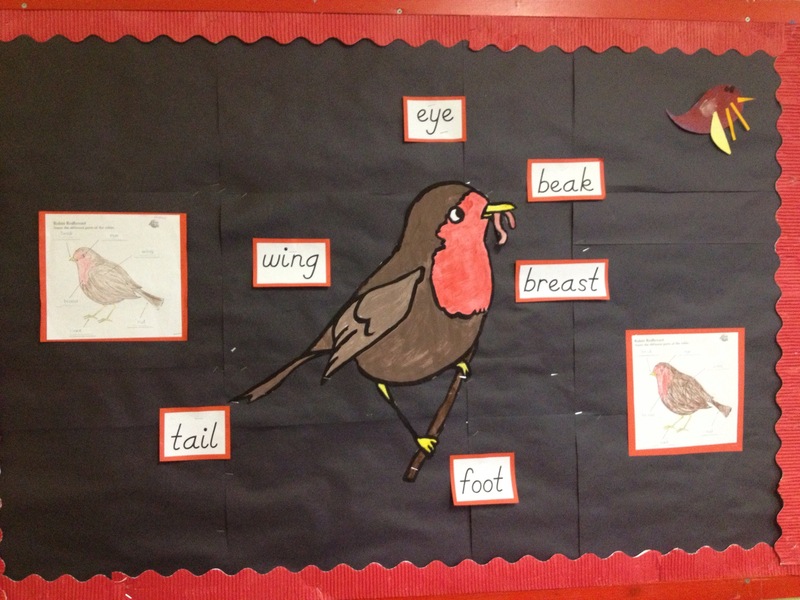 The Reception class also took a scientific approach to the season with their “parts of” displays. Montessori created a wonderfully scientific and sensorial approach to learning about botany and the animal kingdom in the early years. “Parts of” jigsaws allow the child from the earliest experience to become aware of how the parts of something come together to create a whole. Once the child has sensorially internalised this, they can move to connecting the names of each part. This serves as the first stepping-stone to further study and dissection of the unique characteristics of each aspect of the natural world. 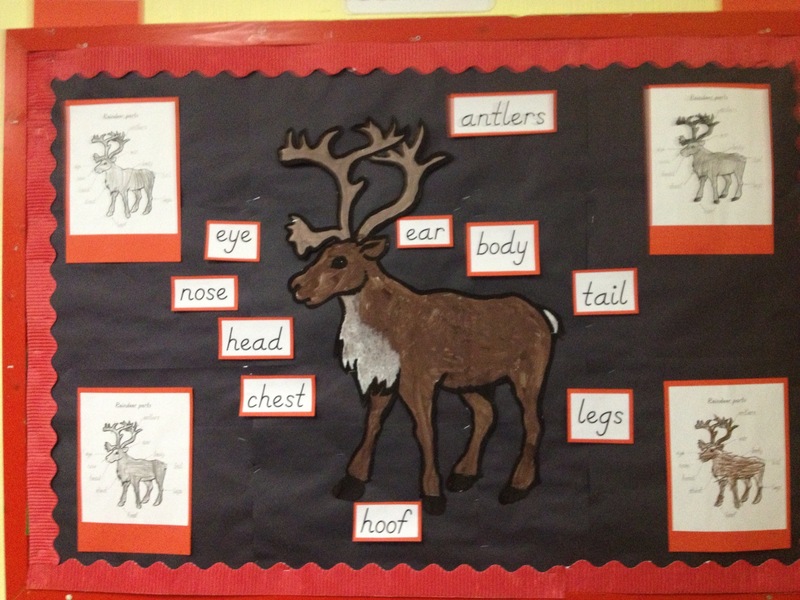 The Reception class chose the seasonal emblems of Robin and Reindeer. 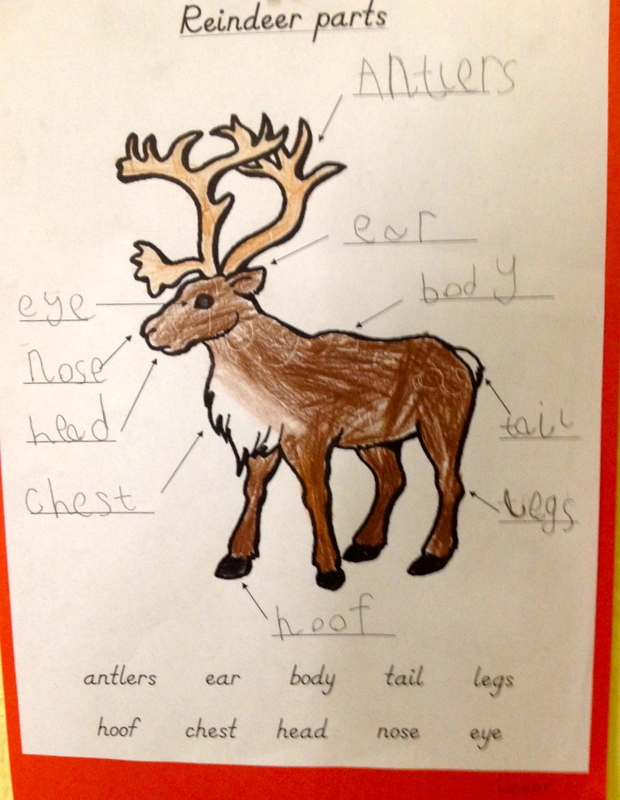 The robin is a standard of Montessori part of study, but the reindeer is a lovely departure to inspire the students to look further than the materials to hand and a commendation to our staff who love to encourage the students to pastures of new learning. 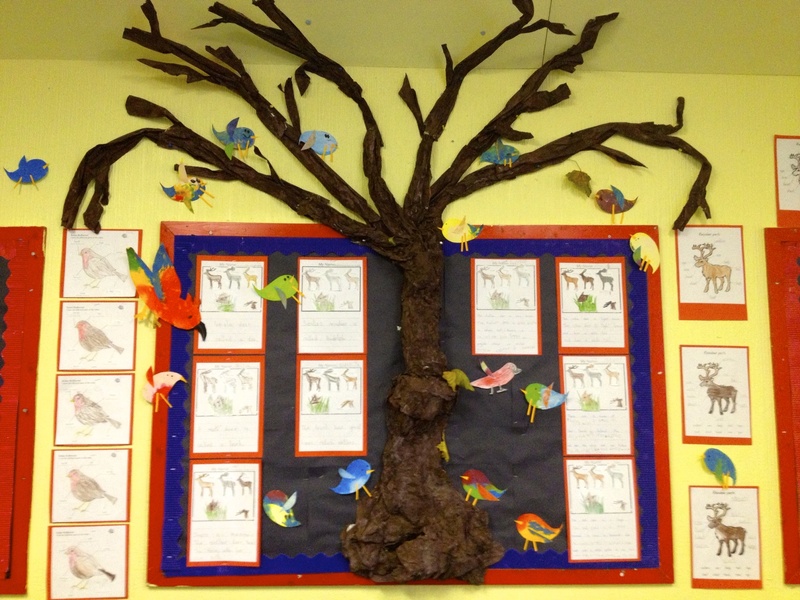 The beautiful winter tree display with migrating birds leaves the room cheered to brightened the darkest winter spirit and serves to house the parts of labelling work that the students undertook either by handwriting each label (if they are at the writing stage) or cutting the appropriate labels (if they are at the reading stage) and identifying the parts during independent work. It is this independent work at the child’s level that is vital to the Montessori class, each contributes the work at their stage and all work comes to form the class board, no one feels in front or behind as each contribution at that students level is vital to form the whole and leave the student feeling accepted as an individual part of the unified class community. 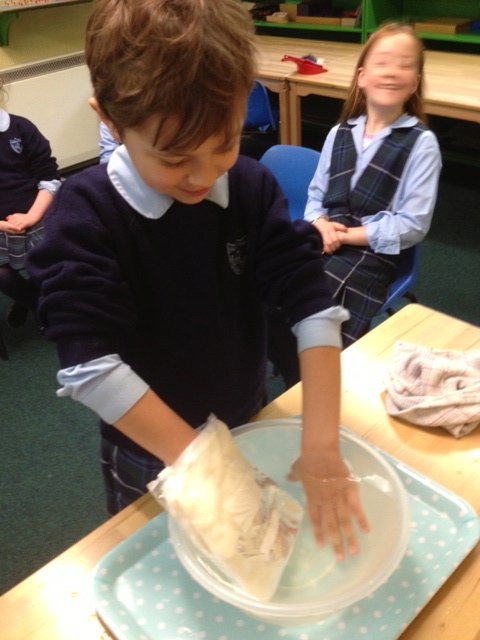 The nursery class proved themselves, as ever, an art and craft phenomena. The scale and amount of projects and displays they create are astounding. 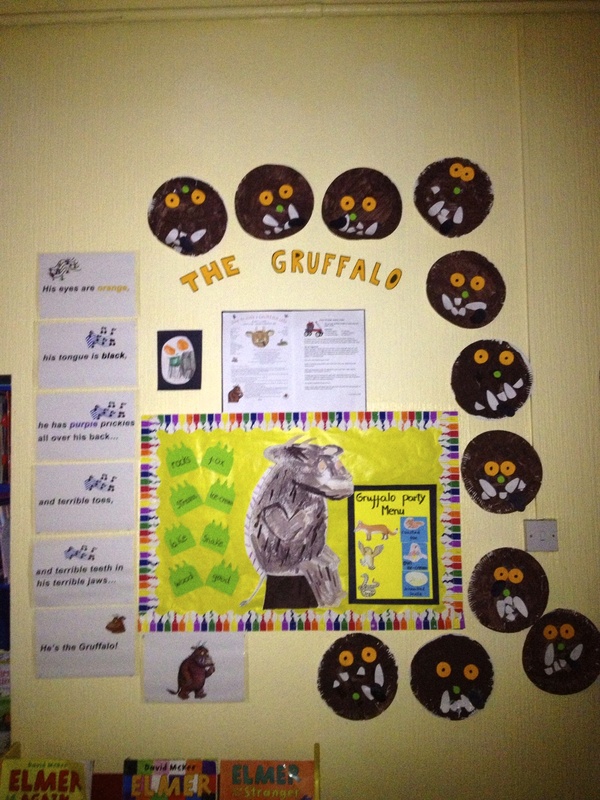 It brings great joy to the class and their teachers to fill the room with wonderfully creative and bright display boards. 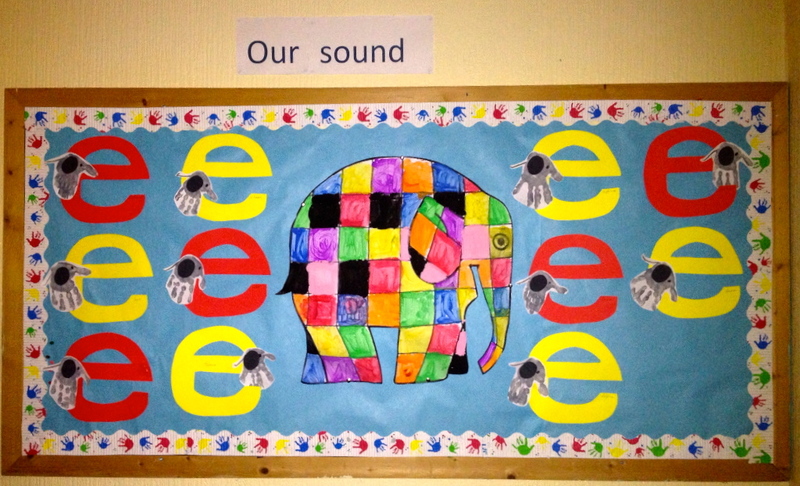 November saw them on a literature exploration with Elmer the Elephant as the face of their sound of the month “e”, the elephant handprints are just exceptional! 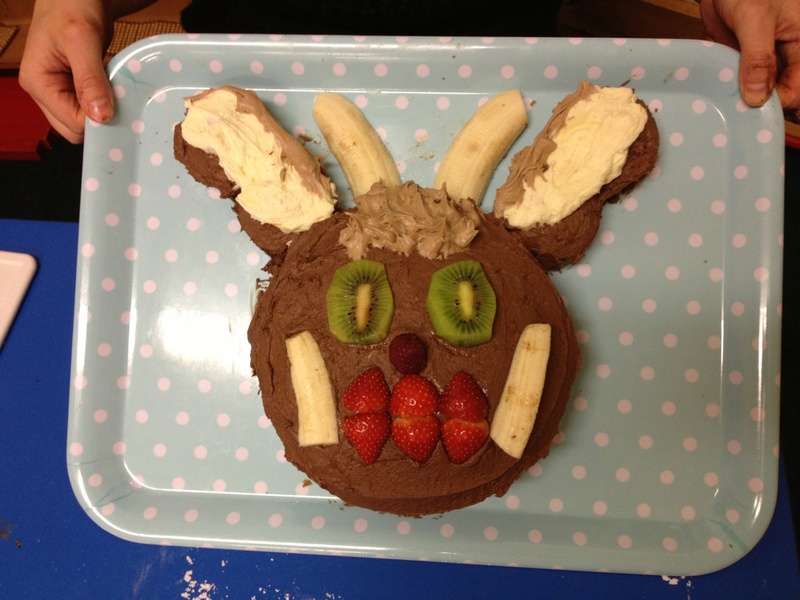 They threw a party with the Gruffalo, on the party menu was scrambled snake, roasted fox and owl ice-cream and if that didn’t tickle your taste buds then the Gruffalo cake was sure to please the discerning palates of the nursery community. I loved the Dr Seuss like rhyming words on the board, it’s a fantastic way to open the student’s ears to the sounds in words, and vital to inspire the word building that they are embarking on. 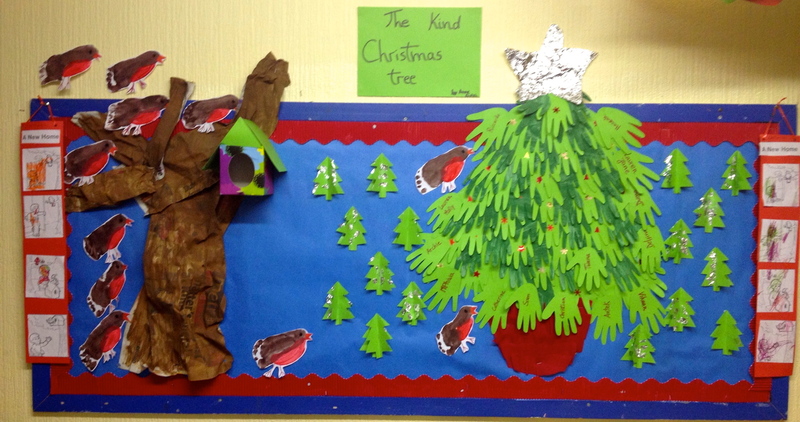 Annie Enright’s ‘The Kind Christmas Tree” took us on a journey of empathy with the birds to whom the kind Christmas tree gave homes to, a wonderful way to begin a conversation about the spirit of the oncoming Christmas season, being kind to others. 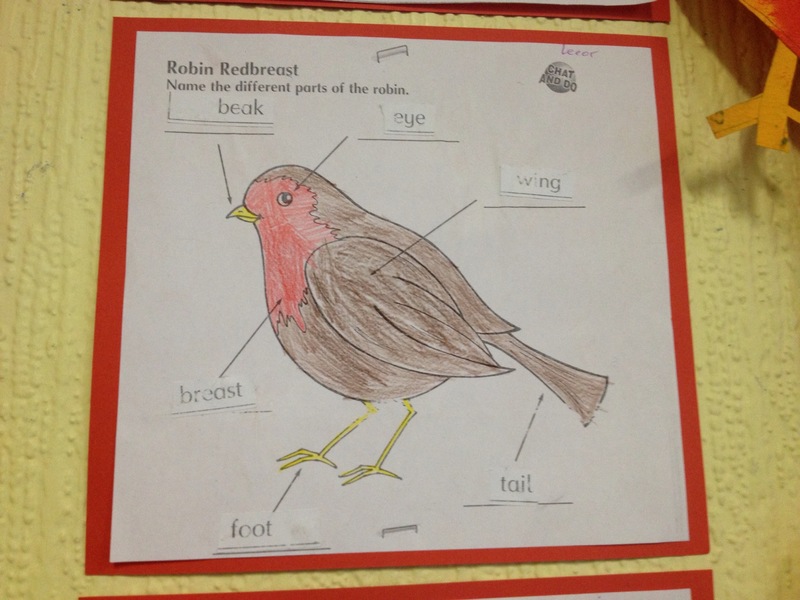 The footprint robins are so cute and I’m sure when they go home they will make wonderful Christmas tree decorations for years to come. 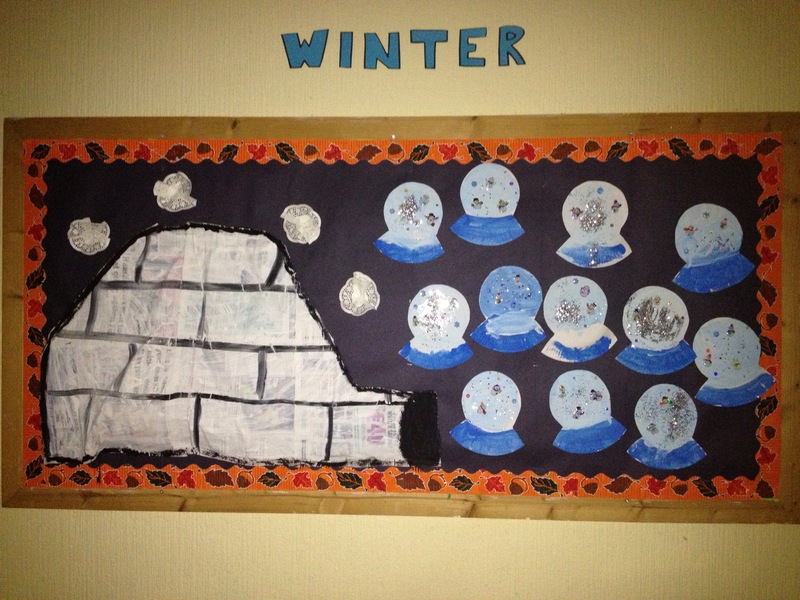 The continent studies in the nursery this month was the Arctic and Antarctica. 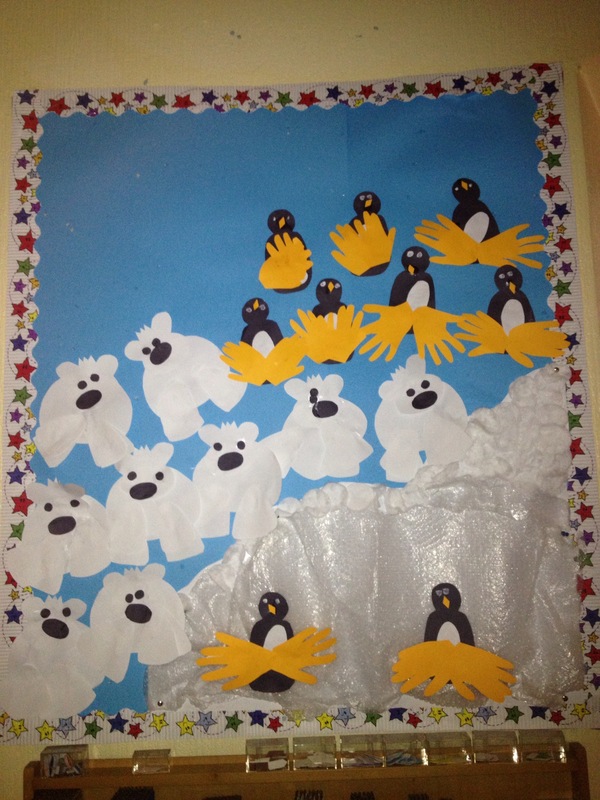 The students filled the walls with penguins, polar bears, ice caps, walruses and puffins. 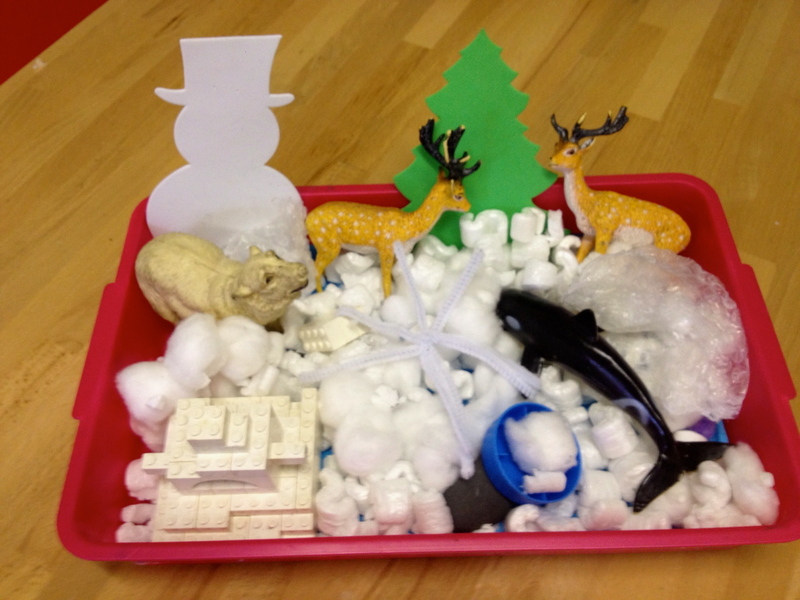 They had lots of experiential fun with the Arctic sensory box. A sensory box allows the student to explore the colours, textures, sounds, smells and even tastes (depending on) attached to the topic. Small imaginative play items allow the child to construct meaning and explore the subject matter at hand in their own way. The sensory box was very popular and we will with the aid of the students create more on further topics of study. The seasonal theme of winter was also explored and illustrated in the displays and circle time talks on aspects of the season. 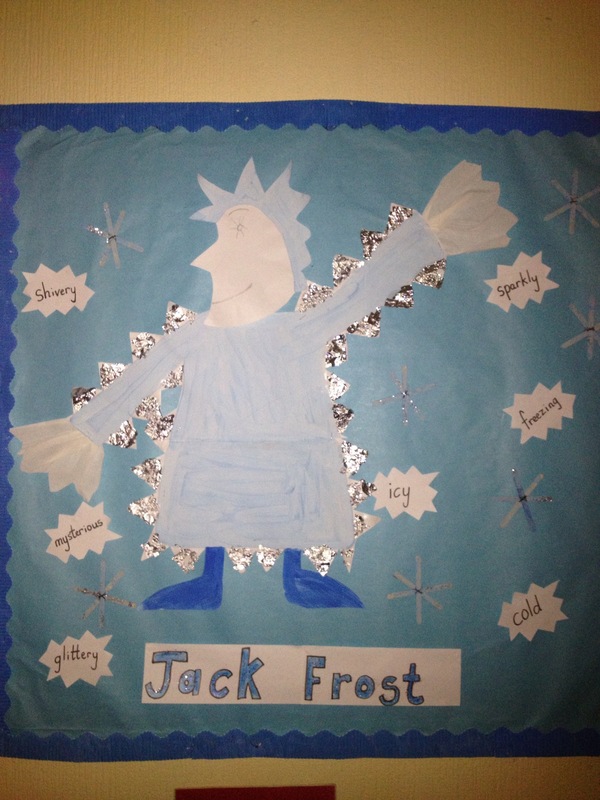 Jack Frost and the words that describe his work was illuminated on one, another depicted an igloo and winter scene snow globes, while paper cut snowmen was the icing on the cake for me. 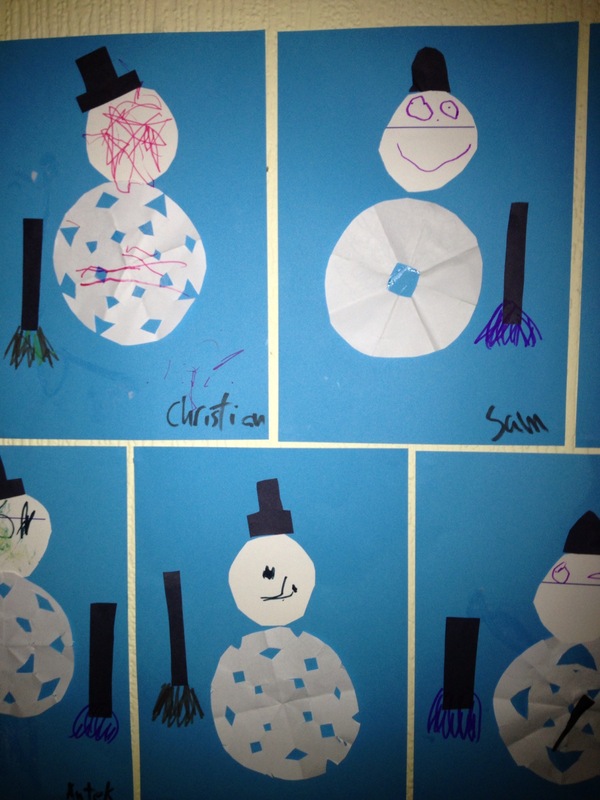 They really have created a “winter wonderland” of seasonal art. With the season of winter well underway, we begin to decorate our classrooms for the Christmas festivities and we are looking forward to sharing all our holiday handiwork with you soon. Students and Staff of Hedley Park.